A NEW NEIGHBOR on West Washington in the heart of downtown. 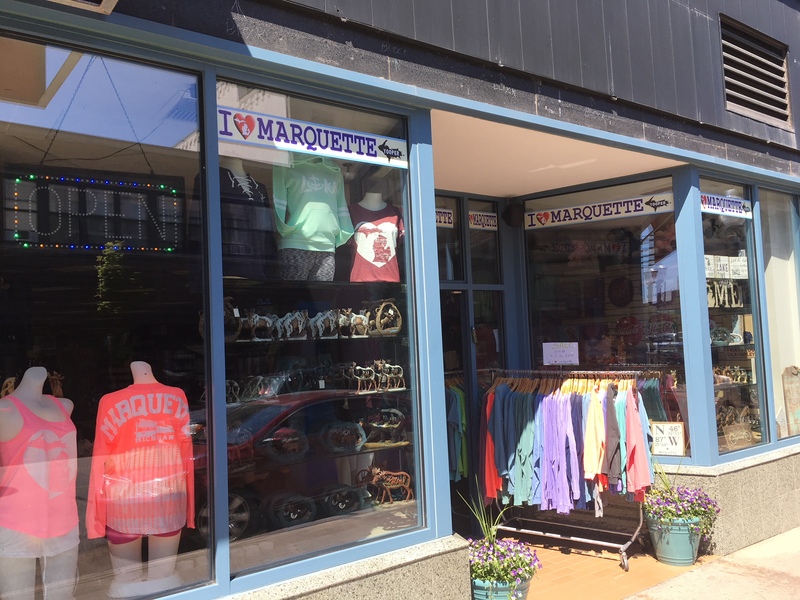 It’s “I Love Marquette,” a shop that sells tons of clothing and knick-knacks much of which, not surprisingly, expresses love for…Marquette. A couple things that give you pause. It’s not a local owner. We’re told by the clerk there that he’s from Minnesota. And he owns several other “I Love….” stores. A chain store, in other words. Further, she says, the I Love Marquette store plans to stay open later than most of the other stores downtown. A positive move especially during the summer, she believes. She hopes other stores will follow suit. One other concern: the clothing at the new store is generally less expensive than the merchandise at Marquette’s local clothiers. Will tourists opt for something cheaper and more generic over the more unique and higher quality clothes at the local stores? Let’s hope not. Let’s hope there’s room for everybody in a town that’s increasingly catering to tourists. Here’s why we love the locals. 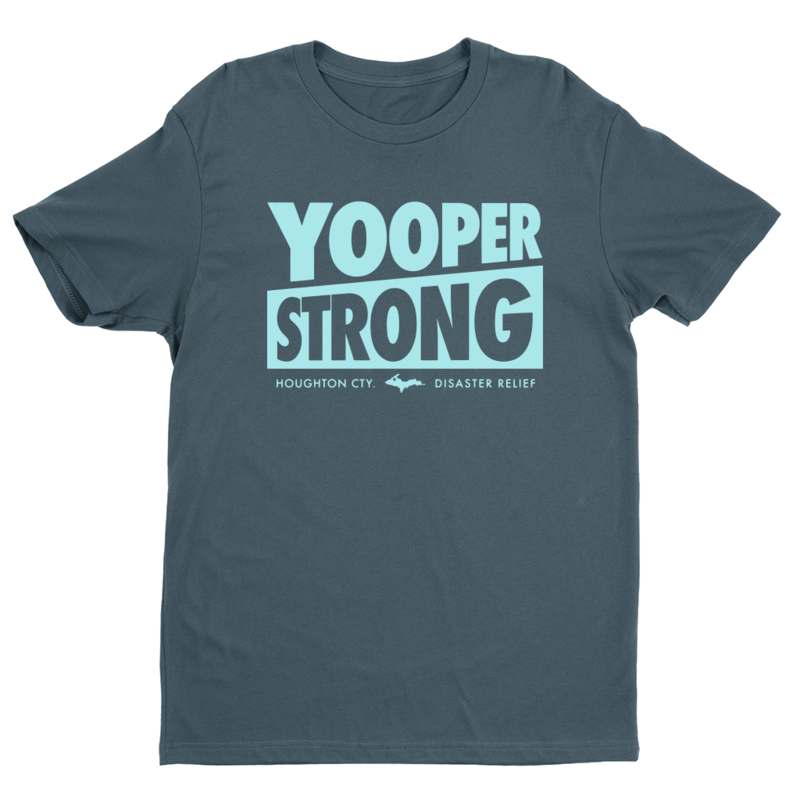 Three days ago, Jeremy Symons of Yooper Shirts on Third Street told his Facebook followers they were selling newly designed “Yooper Strong” shirts. 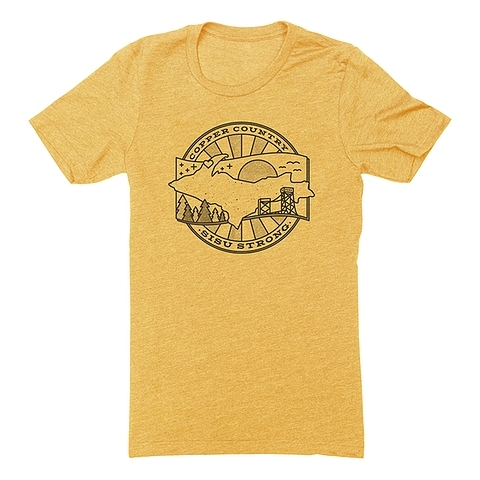 At least $5 per shirt from sales would go to victims of the Keweenaw flooding. 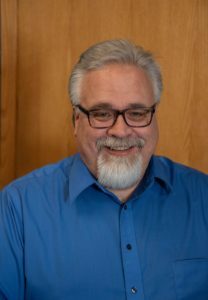 Specifically to the Keweenaw Community Foundation. More than 200 shirts were sold in the first 48 hours. “Orders are coming in every ten minutes,” he says. “It’s been crazy.” The shirts are already in and are being sent out. And then there’s Bugsy Sailor at UP Supply Company on West Washington. They started selling “Copper Country Sisu Strong” shirts last Wednesday. More than 900 pre-sold so far. Orders have come from 45 states. The shirts should be sent out, Sailor says, within the next day or so. All profits going to the Portage Health Foundation. That’s what you get with local entrepreneurs invested in the area. They care about more than money. They care about their neighbors. IF YOU HAVEN’T seen them yet, you’ve gotta go downtown. They’re in exactly the same spot where the colorful umbrellas captured all the attention last summer–right alongside the Zephyr wine bar. Again this year, it’s a public art project sponsored by VAST insurance and put together by the DDA. 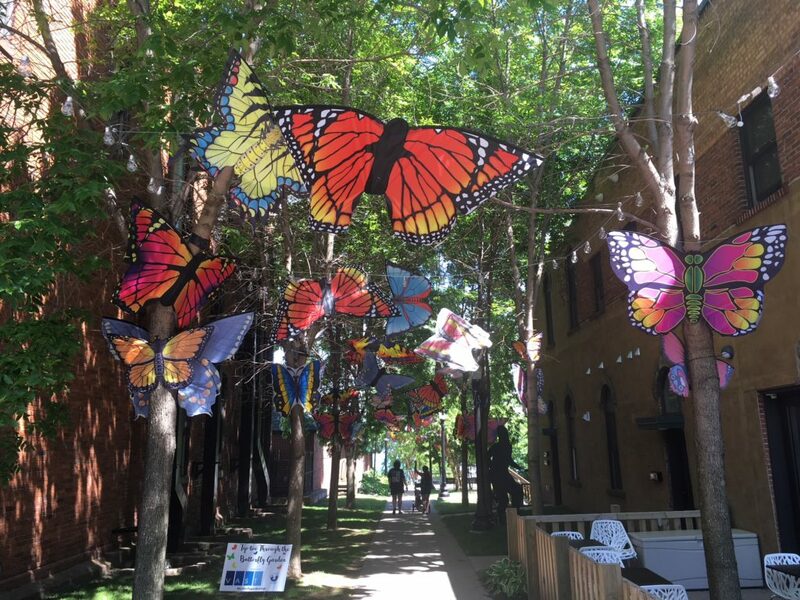 Like the umbrella display, it will likely be the most photographed spot in Marquette this summer. The only concern is how well the butterflies, which are actually kites, will hold up in strong winds and heavy rain. Maybe we’ll never find out. Maybe it’ll be 75 degrees and sunny with a mild breeze all summer long. LAKE SUPERIOR’S WATER level is rising (3 more inches last month), but it’s still well below its level last year when it neared its record high. This, according to the Army Corps of Engineers. It’s forecasted to rise another 1 inch in the next month but right now it’s 5 inches below last June’s level. The lower levels mean wider beaches, which is good. Right? 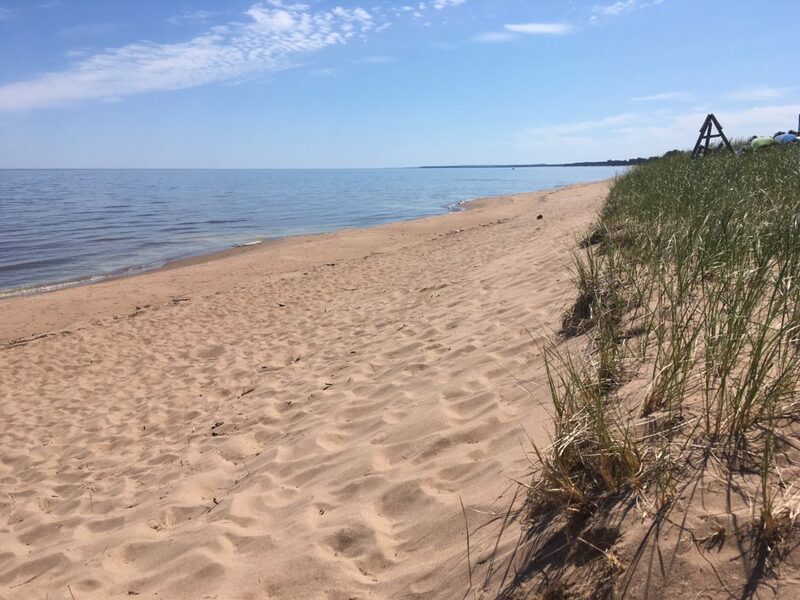 But the beaches throughout much of Marquette County are wider still because last fall’s storms chopped away at many of the beach dunes protecting the shore. And that’s bad, right? Or maybe that’s just Mother Nature doing her thing. YA WANNA BE a cohost on one of the UP’s most popular radio shows? Well, Walt Lindala of Sunny FM is looking for you. After Mike Plourde left the morning show to host middays, Lindala thought he’d found a new cohost but unfortunately that didn’t work out because of family complications for the cohost. Hence, the continuing search for a partner. He’s hoping to find one within a few weeks. Shouldn’t be difficult. All you need for the job is talent, a voice, chemistry, knowledge of the area, and a willingness to get up at an ungodly time in the morning. 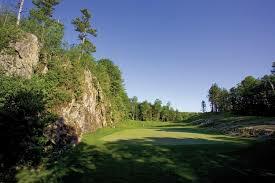 The Detroit Free Press has listed it as #6 on the list of Michigan’s Top Vacation Golf Courses. No other UP courses made the list. Bay Harbor Golf Club was ranked first. Disagree. You will mind it. You’ll be irritated. You’ll be uttering curses. But yeah, we get the idea. It’s a gorgeous and challenging course.